New molds just hit our warehouse today, fresh off the mold presses. We couldn’t be happier about what Erik has designed for us and hope that you find these modern, whimsical designs equally appealing. Want your own custom mold? Erik is a miracle worker. Email him here. Buy the Heart Grids here or the Beads on a String here. Another thing that’s been keeping our team busy this week is prepping for our ultra cool (wait? am I maybe a bit biased?) Bramble Berry newsletter. If you’re not a subscriber, you can sign up here. Can’t wait? Here’s a sneak peak into the newsletter tomorrow (below). 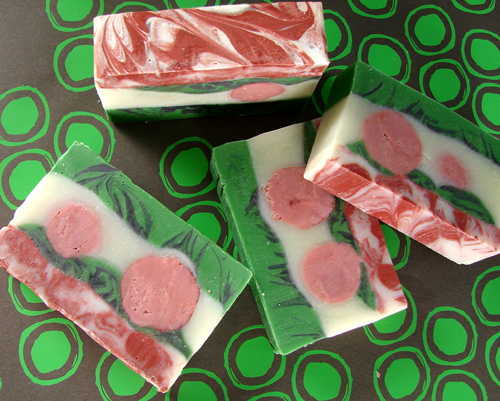 There are full instructions on making my Soap Swap Cranberry Fig soap. 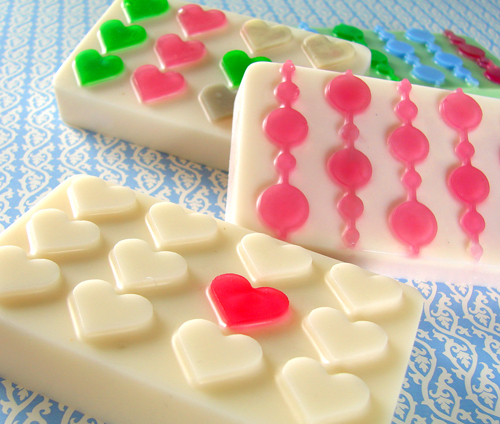 Wondering how to make the soap? Sign up for the newsletter on the homepage (right side, middle). It will be hitting email boxes in timed waves after midnight tomorrow (Wednesday) in time for you to see it Thursday. Thank you happy customers and Soap Queen readers for keeping our warehouse and customer service team hopping. We are so excited to see the holiday orders pouring in and are currently processing orders at 1-2 day turnaround so give yourself an extra day or two to get your super sweet soapy supplies from us. We are working weekend shifts and late nights and are so thankful for the business. Thank you, thank you, thank you! How did you make this? How do you swirl CP soap? These are just adorable! Nice job Erik! Yay – we’re scheduling it right now. It should start emailing out in waves around 10 a.m. tomorrow. Erik doesn’t work much in silicone. He can. His specialty is vacuum forming molds, like the Heavy Duty molds. Such cute molds – agree! I love the beads on a string! I can think of so many fun things to do with it. And yes, all weekend long I have been thinking of how to get an order to Erik. Can he do silicone? I am designing right now….. Your Cranberry Fig turned out so pretty! I can’t wait to receive my newsletter to see how you made it! I love the new molds!!!!!!!! The new molds are great!! !